Our camp in the wilderness offers an unusual, experiential place to stay. The service we are offering is an all inclusive accommodation package. Walking with our team is not a commercial service and is not sold or priced. Walks with us are a bonus to the accommodation package. Arrive at the lodge early afternoon for tea or lunch and acclimatize to your surroundings. In the afternoon, after 4 pm go with our tracker team on a walk in the vicinity of the camp. 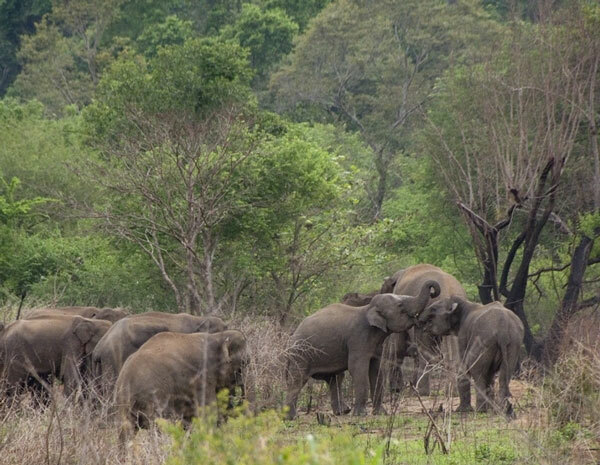 You will see more of the camp surroundings, be introduced to the main elephant tracks and would get more understanding of the wild nature of the place. Return at 6 pm. Get ready for the evening; hurricane lamps will be placed outside your room. A sun downer is served around 6.30 pm and dinner is served around 8 pm under the moon or the canopy of stars. The last hour before sunset offers the best chance for observing elephants in daylight around and near the camp. �Jungle walks� usually take place in the morning after breakfast (start around 9 am) and afternoon (start around 4 pm). As a rule of thumb the duration can be from 1 � 2 hours. As far as possible walks can be tailored to meet special interest requirements of clients. Birders would prefer early morning walks before breakfast. We would attempt to avoid walking in the hot mid day sun and heat. On all walks, clients will be accompanied by our 4-man Tree Tops tracker team. The trackers are the staff working at the camp. We are all able to be part of the tracker team on walks. A primary aim of the lodge is to employ locals and use their knowledge about the jungle in a constructive way. Wake up to the sounds of nature, early morning tea, coffee and breakfast at your leisure. Around 9 am start on a walk that will take you inside the dry zone, mature and tall virgin forest. As soon as you are under the forest cover the air is different and cool. 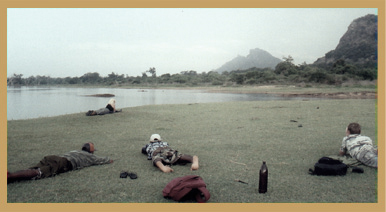 This is a protected forest connected to the Yala National Park, about 7 km further to south. Walking on animal tracks, we may see signs from the previous nights� activity. We might come across footprints of sloth bear and paw marks of leopard as well as wild elephants� footprints. All dry zone forest birds can be spotted in this forest. There are still ebony trees here, a rare tree to see in the forest today. We might make a small trek up on a mountain, to an open rock place from where you�ll see a panoramic view to the east and south. All jungle, in fact you can see into an almost complete overview of the total Yala National Park. Return to the camp around 11�11.30 am. In the afternoon around 4.15 pm start on an excursion to the lakes in close proximity to the camp. Stay for some time at a lake; enjoy the scenery and the birdlife unfolding. With a bit of luck, elephants can be observed drinking water. Get back to camp around 5.45 pm in time for a shower before the 6.30 sundowner. The stay with us is not in a safari park but some aspects of wild nature are experienced in a better way in our camp than on a safari. The sounds. Night in the jungle is defined by darkness and strange sounds. Some of the wild visitors at Tree Tops are the elephants passing close by. Usually they are very silent but frequently they break branches or are heard trumpeting. An impressive and most rare phenomenon is the 'song of elephants' � The long distance communicating of hers with sound waves like whales. Elephants are always on the move and they come and go in the area around Tree Tops Jungle Lodge. Recommended is to try to 'do nothing' but follow the natural rhythms of the jungle. Relax and listen to the sounds. There's a small library with books about the Sri Lankan elephant, nature, and history. The local staff is highly skilled in the art of interpreting the signs of nature and visitors could learn to understand some of the sounds and smells of the jungle. WALKS. If you still want to be active, we can make similar walks as described for the first day but slightly different. Planning of walks always depends on the movement of wildlife. At Tree Tops Jungle Lodge, our main specialty activities are the local walks in the area around the camp, into the forest and to small lakes. Best times for the trips on foot are morning and afternoon. We have a type of �standard walks� but much depends on what we decide is best on that particular day and the moment. Walks have no physical target and they are typically leisurely more than exhausting. Walks are rarely cancelled. They are planned at our discretion and may be shorter or changed. They also depend on natural factors such as the weather and the movement of wildlife, especially elephants. Copyright 2001 - 2013 Tree Tops Jungle Lodge.